Glamping has become very en vogue with campers who instinctively seek a camping lifestyle but have no intention of either roughing it or travelling light. So it stands to reason that glamping accessories and specialist glamping equipment are becoming the next big thing too. We’re not talking about pitching up with a typical 4-man tent, with a basic survival kit, some tinned hot dogs and a can of beans for breakfast. No, this is definitely camping at its most luxurious, extravagant and fun, with all the frills and bunting attached! Take a look at a few other great ideas for glamping accessories in our own online store. A fabulous company called The Glam Camping Co. is taking the industry by storm by launching a website selling a unique collection of cool camping paraphernalia and glamping accessories, and proving that it can be both affordable and ethical, as they source all of their products either in Wales where they are based or Britain. 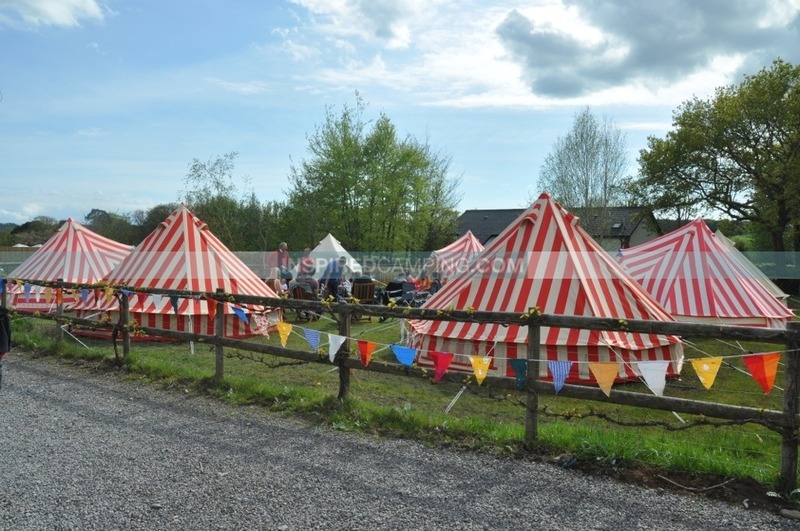 They also recently held a Glamping Festival at the exquisite Llanerch Vin eyard in the Vale of Glamorgan, South Wales, resulting in a field packed with happy glampers who enjoyed family activities by day, a soul band in the evening and finishing up with an amazing firework display and acoustic singing around the camp fire. We chatted with Ali Torkington, Co Founder of The Glam Camping Company, at the festival to find out about plans for their business and the future of Glamping as they see it. She also gave us her top 5 tips for successful glamping together with recommended kit for a stress free luxurious camping experience. Ultimately we wanted to raise the profile of glamping in the heart of The Vale of Glamorgan, after all what better way is there of displaying our newly popular Strawberries & Cream Bell Tents? We also wanted to display our entire collection of glamping accessories for the public and show everyone what a superb venue the Llanerch Vineyard is at the same time. However, it wasn’t all about business as we also chose to support St. David’s Hospice, the chosen charity of Adam Jones, Capped rugby player for Wales. This resulted in a special guest appearance from the man himself, and together with the entertainment made sure everyone had a glamping festival to remember. 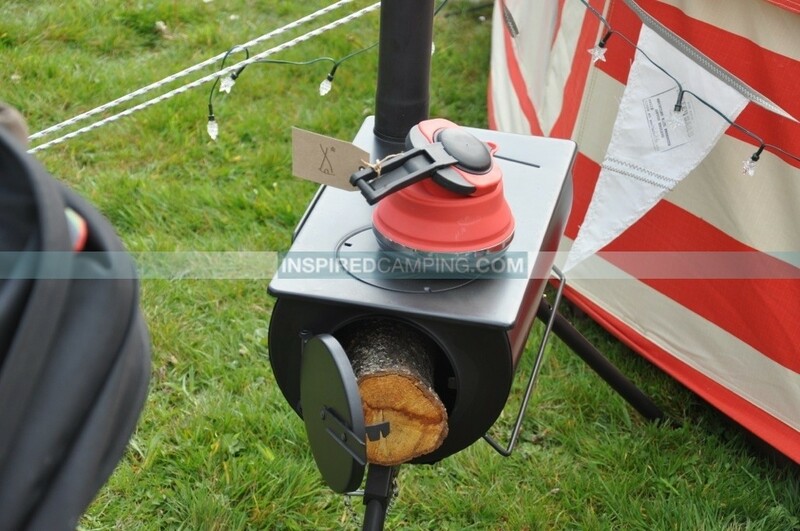 Why glamping accessories and specialisted glamping equipment? I started this business as I saw there was a gap in the market for unique and luxurious camping accessories. After years of camping with family and friends I realised I wanted to enjoy my campsite holiday with the finer things in life. In my attempt to source some of them I struggled to find anyone who offered anything more than traditional camping and survival gear. Now our product range is growing by the day. There is definitely a boom in the glamping industry at present and the future looks bright in the UK and right across the globe. As for our festival we’d be really happy for it to become an annual event in the camping calendar in South Wales. What are your top 5 tips for successful glamping? Ram as much gear into your car, caravan, campervan as possible! 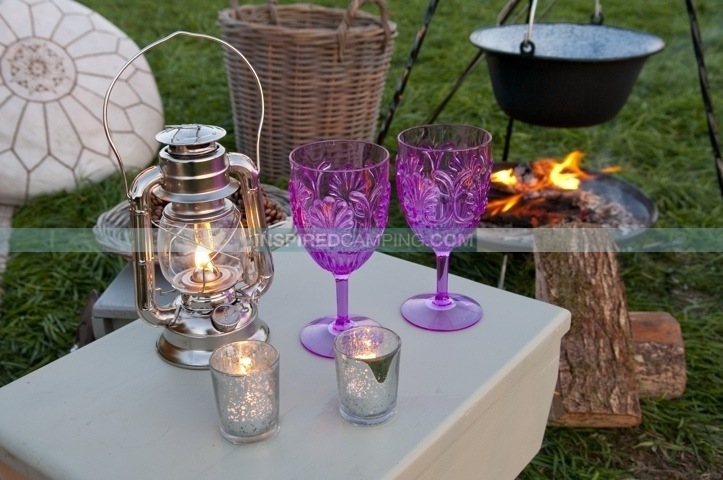 Lighting is important so do consider taking candle lights with holders and lanterns as these really do create a beautiful mood at the camp site. Take lots of pretty accessories including bunting which is so light and easy to transport. Consider some small vases for decoration with wild flowers. Scatter pretty cushions with throws to give that extra cozy feel around the tent. Let the men get involved with what they do best – hunting and gathering. You will then have plenty of time to make your tent look glorious while they get the fire ready to cook up a feast. Take lots of friends with you as it’s always more fun with lots of happy glampers. What are your top 5 glamping accessories? Our Strawberries & Cream Bell tent! A Cool Box. We sell a fabulous one that keeps food and drink cold for 5 days on 1 charge. Tanya Brooks-Dowsett is a keen happy camper and lover of all things Glamping. Growing up near the North Wales coast and now living with her busy family of water sport enthusiasts, she lives for the beach life. She spends her days as Marketing Director for her husband’s business Pura Vida Boardriders and her evenings being a busy mum trying to grab some time to write her blog and book The Wave Riders Widow. Tanya is an adventurous idea generator and helps to organise the BWA Wave Sailing Championships at some of the UK’s most stunning beach locations such as Tiree in the Inner Hebrides and Gwithian in Cornwall. Here’s another glamping business in the US that has got their luxury mix just right. For more about the history of glamping take a look at Wikipedia’s explanation.